Perhaps the most innovative new patrol equipment advertised during SHOT Show this year was the Duty Smith, Street Force Rapid Deployment Gear. 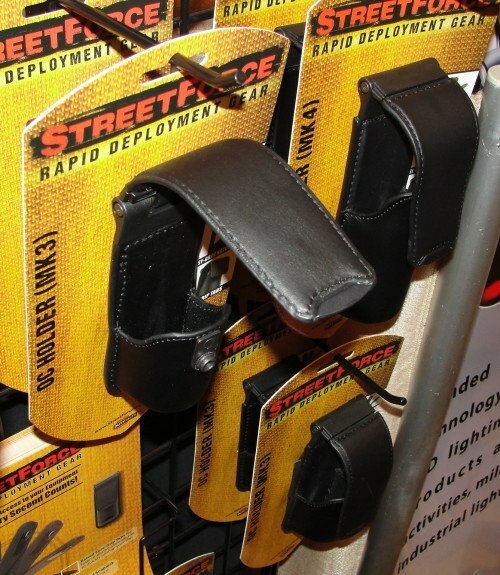 The Street Force gear covers just about everything an officer needs on their duty belt, except for their holster. 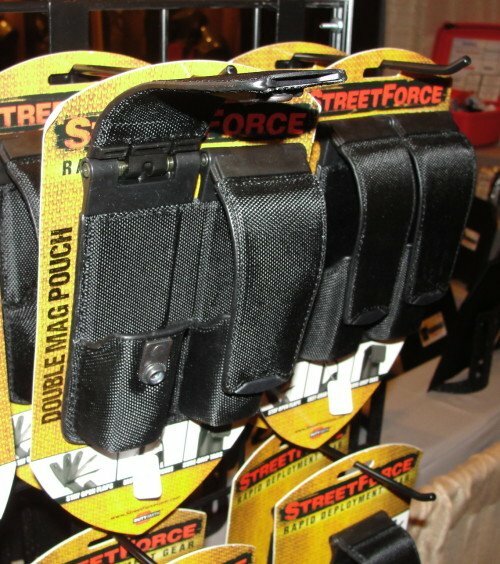 The innovative design of the Street Force Gear is how the gear pouches open and close. 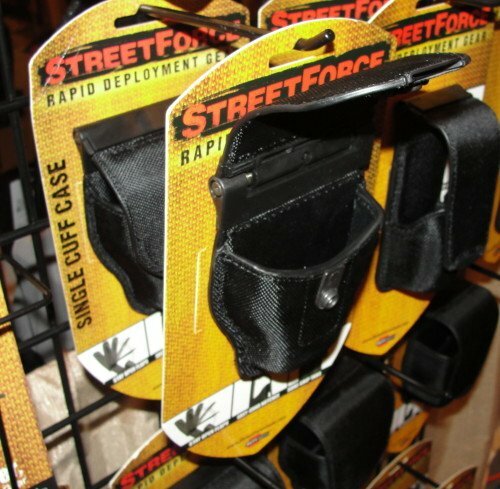 The Street Force Gear was developed with Las Vegas Metro Police Officer Bob Hindi, who is already known for his baton cap, and duty holster system. Flashlight Holder – Coming soon. Traditional leather, nylon, or other duty belt pouches and holders simply have a flap that snaps into place or has Velcro to secure critical gear. When an officer needs to retrieve a gear item, they are required to manually unsnap the flap, move the flap out of the way, and then retrieve the gear for use. In the same manner, to return gear to the standard pouches, an officer must manually move the flap out of the way, return the gear to the pouch, and manually re-secure the flap by the snap or Velcro. Combination Flap Magnet and Snaplock. The Street Force Gear is backed with 2.25″ heavy nylon belt loops to fit a wide variety of available duty belts. These loops and the rest of the Street Force Gear were designed after active duty wear feedback, and are aimed at providing a snug fit that still allows a variety of duty belt sizes. The magazine cases allow for vertical or horizontal belt carry. 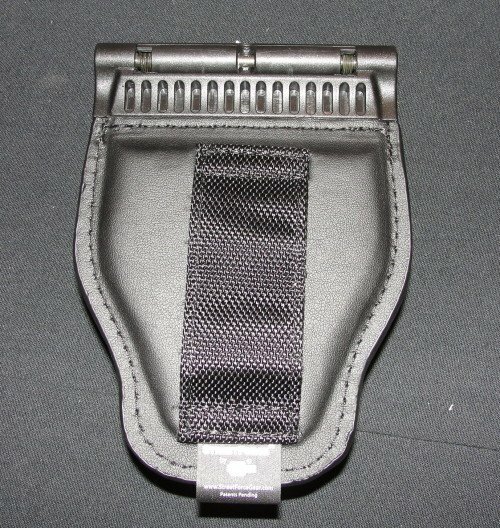 The handcuff case and OC holders have a smaller nylon belt loop. 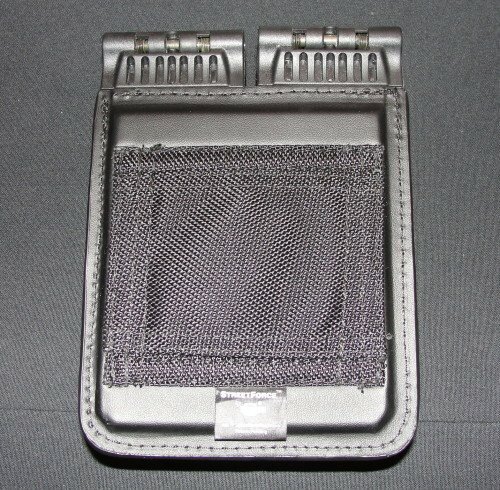 To assist with the initial unsnapping of the flap of a Street Force Gear pouch, the designers included a raised sure-grip tab that allows an officer a quicker index to unsnap the pouch. The pouch flap is also slightly longer than traditional pouch flaps, allowing additional finger space for easy access to the raised sure-grip tab. Opening the Street Force Gear flaps was very easy. Notice the extended length of the flaps on the double magazine holder. This provides additional space to reach the raised sure-grip tabs at the flap edge. To move the flap out of the officer’s way, and provide a much quicker securement of the flap upon gear return, the Street Force Gear has a spring-loaded hinge at the apex of the flap. When an officer unsnaps the flap, the hinge automatically springs the flap open to a straight up position. The flap is hard-shaped with a curve for closure, so in the open position the curved part will extend outward at about a 45-degree angle from straight up. Now there is plenty of open space so the officer has nothing to interfere with their hand in removing the desired gear item. The Spring-Loaded Hinge keeps the flap out of the officer’s way during withdrawal and insertion. Closing the Street Force Gear flaps is easy with the guiding magnet ramp. 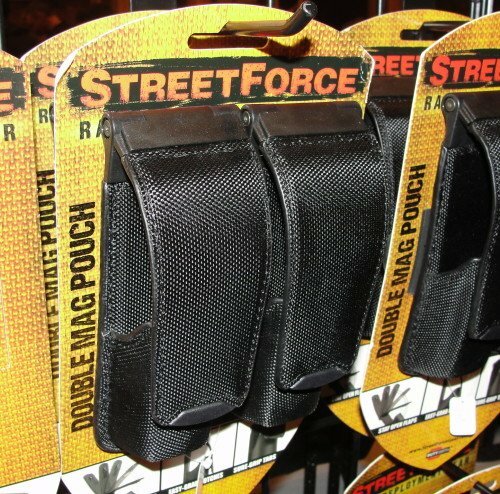 When reaching for the particular gear item, the Street Force Gear has enlarged cut-outs on the pouch itself, instead of lower cut-outs or a straight lip design. This provides the officer much more surface area of the gear item to grab with their fingers. In a high stress situation, this will help the officer retrieve the item even though their fine motor skills may already be diminished. Notice the Enlarged Cut-Outs on the side of the OC case allowing the officer more space to grab the canister with fingers or hand. The small OC case is on left, with the large OC case on right. Once the gear item is grabbed by the officer, the Street Force Gear is designed with a smooth, snag-free interior surface so the gear naturally and easily comes out of the case. This smooth surface allows the gear item to slide out or into the pouch without any type of material interference. The Spring-Loaded hinge keeps the flap up and out of the way. Note the smooth surfaces on the inside. Finally, the Street Force Gear uses a combination magnet and snap-lock for securing the flap. In a hurry, the last thing an officer needs to be fumbling around trying to get that stupid snap to snap. 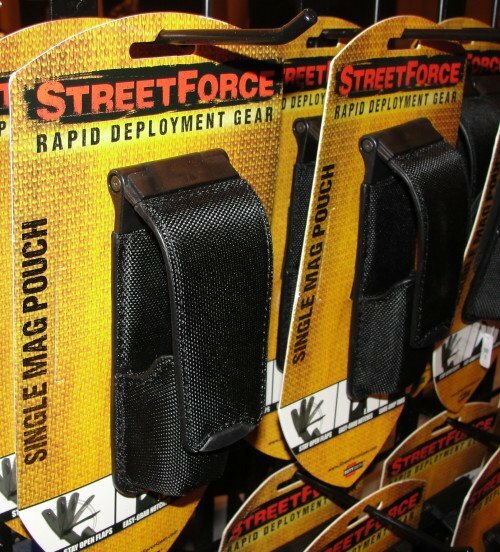 The Street Force Gear pouches all come with a magnet behind the snap. This magnet does two separate functions. First, the officer can simply swing the flap down and the magnet will grab and hold the flap. Second, the magnet automatically aligns the snap for easy final securement. When the officer is ready to complete the securement all they have to do is slap the flap to engage the snap. Much easier than traditional lining up of the snap parts. Note the Magnet and Snap Lock combination. The magnet draws the flap into place and holds it there until the officer slaps the flap to finish the snap. On the SHOT Show floor Michael Fineberg walked me through all the Street Force Gear and their features. Fineberg had a duty belt loaded with Street Force Gear, and he showed me all of the advantages in action. I was also able to take individual items and manipulate the features. I really appreciated the spring-loaded hinge and the magnet. I wish I had the opportunity to test out the gear in a duty rig set up. We’ll work on getting a T&E set from Duty Smith for a follow-up review. From my limited time with the gear, they worked as advertised, and I could see how these advancements could shave time off of retrieving and holstering gear. All of that means an officer has more time to take care of business, hopefully keeping the officer safer. The one drawback that I found with the Street Force Gear is that the solid backing to support the spring-loaded hinge, causes the cases to ride higher on the duty belt than traditional carriers. This “may” hinder an officer when bending over, and may be uncomfortable for officers whose mid-sections are starting to seek out new territory over the belt. The stiffer and taller backing might cause discomfort for some officers. I’ve used Clarino and Nylon duty gear my entire career (almost 18 years now), and with each of those types of gear I have had several occasions where I had difficulties either retrieving gear, or getting the gear properly stored back into the pouches. The Street Force Gear is very appealing to me. Pricing for the Street Force Gear is affordable, and very comparable with traditional duty gear, despite all of the advantages offered to the officer. It really has me considering a recommendation to my Department’s Equipment Committee. Baton Holder, Radio Holder, Flashlight Holder – Coming Soon, TBA. Have any of you used the Street Force Gear? Let us know what you know!